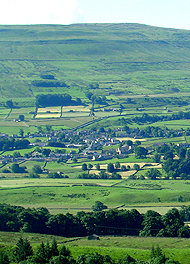 About Shaw Ghyll caravan and camping Upper Wensleydale. Shaw Ghyll is a small privately run caravan and camping site nestled in beautiful Shaw Ghyll, High Shaw, Simonstone and is surrounded by the magnificent Dales fells in the heart of Upper Wensleydale. Situated in Shaw Ghyll, a small delightful wooded valley, with several waterfalls on Hardraw Beck. We are just off the famous Butter Tubs pass. Visit our gallery. This is a wonderfully located campsite set above the Wensleydale town of Hawes with fantastic walks all around - ideal for walkers of all abilities. Great Shunner Fell and Lovely Seat are both nearby. 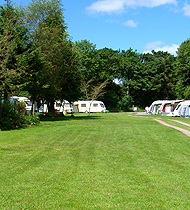 The campsite is quiet and secluded and there are good Dales pubs serving food a short walk away in Simonstone (1/4 mile) and Hardraw (1/2 mile). We are open from 1st April to the end of October.